Our flagship Roastery and Espresso Bar is located just north of Main Street at the corner of Pioneer Street & Stagecoach Lane, in the beautiful village of Cooperstown, NY. 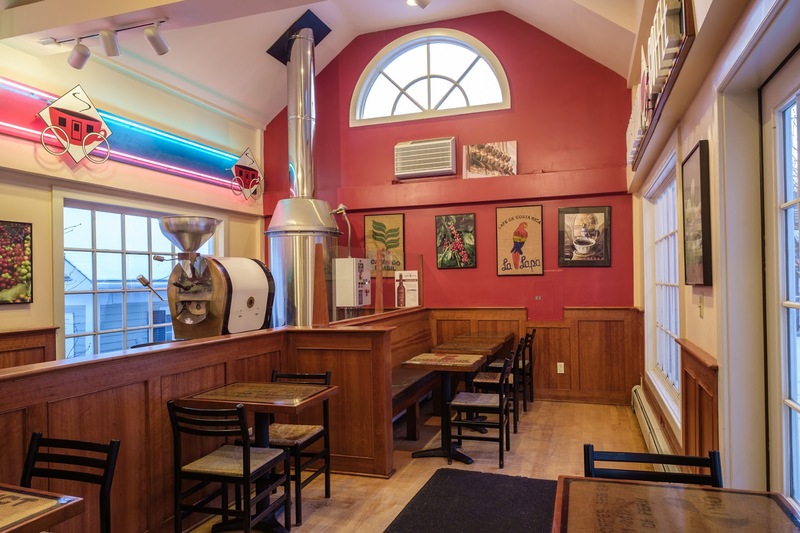 We have been roasting and serving fresh coffee and espresso to locals and visitors since October 1, 1993. We have combined a stylish, modern interior look with a friendly, “small-town” feel to create an ideal atmosphere to lounge with friends or family. What separates us from the rest is, not just our fresh roasted coffee, but our incredible dedication to quality locally sourced foods and excellent customer service. Inside our café you will find the freshest roasted brewed coffee and smooth espresso, daily baked pastries and confections, bagels, breakfast sandwiches, all natural smoothies, garden salads, hot soups, chowders and chilis (seasonal), creamy ice cream (seasonal) and hot “Panini-grilled” sandwiches made with the finest ingredients on locally made Heidelberg bread. In many of our breakfast and lunch items, you will find a variety of locally procured artisan foods from the surrouding Otsego County farms. We are proud to support many of central New York’s independent farms and help them achieve successful and sustainable farming operations. Cooperstown is a village of many wonders, within a 10-minute walk (about one medium cappuccino) you can find and explore almost everything it has to offer. Take a stroll down historic Pioneer Street to Lake Otsego and re-live the pages of James Fenimore Coopers’ The Leatherstocking Tales, play a few rounds of golf at the world renowned 18-hole Leatherstocking Golf Course, or learn about the history of Baseball at The National Baseball Hall of Fame and Museum. If baseball doesn’t move you, stroll down to the Farmers’ Museum to immerse yourself into a real working farm village from the 19th century or drown yourself in a world-class art exhibit at the Fenimore Art Museum. In the summer you can bathe in one of nature’s finest refreshing creations, Lake Otsego, or relax and catch some sun as you wander around and view the historic village architecture. In the winter, ice fishing, nordic skiing, ice skating and snow shoeing are a few of many outdoor activities around Cooperstown. Mixed greens and shredded kale, tomatoes, roasted red peppers, cucumbers, red onion, olives, capers & crumbled feta cheese.